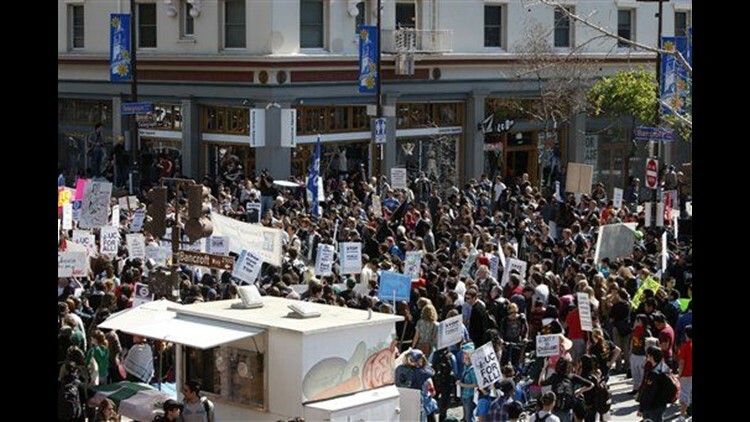 BERKELEY, Calif. (AP) — Rowdy protesters blocked major gates at two California universities and smashed the windows of a car Thursday amid campus protests across the nation against deep cuts in education funding. Protesters at the University of California, Santa Cruz surrounded the car while its driver was inside. The uninjured driver was not trying to get onto campus and appeared to have been singled out at random, Santa Cruz police Capt. Steve Clark said. University provost David Kliger said there were reports of protesters carrying clubs and knives, but Clark could not confirm those reports. No arrests had been made at the school. An advisory posted on its Web site urged people to avoid the campus because of safety concerns. It also said protesters had photographed the license plate of a staff member trying to enter the campus. At the University of California, Berkeley, a small group of protesters formed a human chain blocking a main gate leading to the campus. Later in the day, hundreds more gathered for a peaceful rally against major cuts to higher education funding. Large regional rallies were planned at San Francisco Civic Center, Pershing Square in Los Angeles, Balboa Park in San Diego and public plazas in other cities. "You're paying more and you're getting less for it," said Katelyn Rauch, a senior majoring in political science at California State University, Channel Islands. "Classes are being cut, students aren't able to graduate on time, entire majors are being closed." Associated Press Writers Marcus Wohlsen in San Francisco and Robin Hindery in Sacramento contributed to this report.